California Home Goods is a homegrown brand dedicated to providing you budget-friendly lifestyle essentials. As we continue to bring you products that help make your lives easier, we also know that sometimes, fancy cooking tools and lovely bakeware dishes are necessary to inspire to whip up your best creations in the kitchen. That's why we're excited to bring you our very own Ramekin Set of 8. These cute small ramekins are your ultimate kitchen and dining companions - classic and pretty enough to display regardless of the occasion. Our white ramekins 4 oz bowls are specially made from high-grade porcelain. These small ramikens are 100% non-toxic, food-safe, lead-free, crack- and chip-resistant, designed to last a lifetime! These white ramekin dishes are equipped with a high quality non-porous surface so you are sure that its nice French white color will stay forever. Our 4oz ramekin cups will never absorb odors, flavors, and stains. The fluted, ridged design of this ramikens set of 8 is not only classically stylish but they also help you get a comfortable grip on each one - no need to worry 'bout these slipping from your hands! From meal preparation to cooking, to baking, to serving then dining, these 4oz ramekins are your perfect accessory! Add the California Home Goods Ramekins 4 oz Set to your cart now and start serving your tasty creations in these lovely ramekins dishes. ELEGANT RAMEKIN DESSERT SET FOR ALL OCCASIONS: Impress your guests by serving your creme brulee dishes, custard dishes, pudding cups, fruit dessert cups, rumble pies, cobblerrs, and other tasty desserts in California Home Goods' Porcelain Ramekin Set. With a classic French white and stylish design, this Ramiken Set will simply add a touch of sophistication to any table. DESSERT RAMEKINS WITH THE PERFECT SERVING SIZE: Whether you're showing off your skills on making the perfect creme brulee torch or you're serving flan ramekins to your kids on an ordinary day, these white ramekin dishes simply give you the ideal portion for one. You may even use these ramekins to portion your food just in case you're on a strict calorie-counting diet. RAMEKINS SET OF 8 THAT ENSURE YOUR SATISFACTION: We here at California Home Goods believe that you deserve your hard-earned money's worth. And as we are so confident in the quality of our ramekin dish sets for 8, we offer a lifetime guarantee with every purchase. So if in case you're unhappy with our porcelain ramekin white dishes, simply reach back out to us and we'll be more than glad to improve your overall experience. 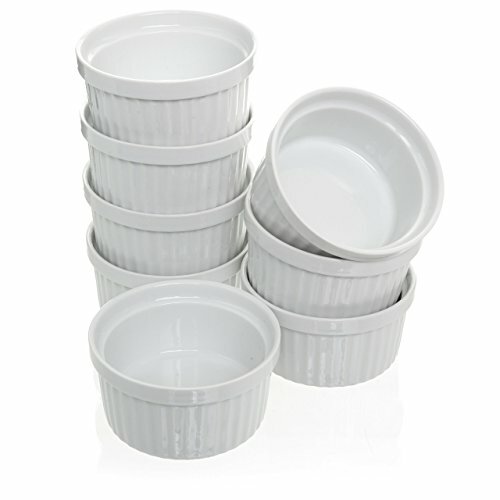 NOT JUST RAMEKINS FOR BAKING: If you think these ramikins 4oz cups or small bowls aren't for you simply because baking isn't your cup of tea, well then think again. Because of their size, style, and durability, you may also use these as ramekins for instant pot pies, ice cream cups, side dish bowls, dips and condiments servers, sauce cups, and more. Put your creativity to test and use these multi-functional ramekins in and around your home.